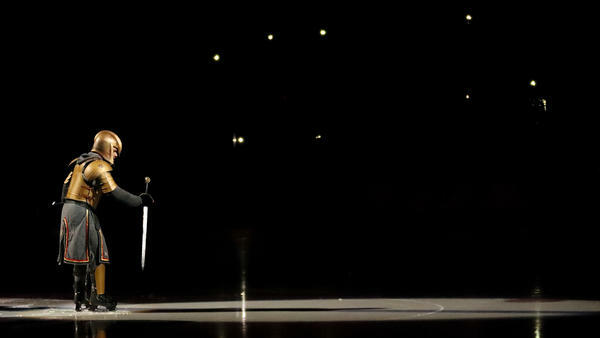 The Golden Knights' mascot takes up his sword before Game 1 of the Stanley Cup Final on Monday. Vegas would go on to win that game against the Washington Capitals — but not before the mascot fought a sweat-drenched duel with a sad-sack stand-in for the Caps. Drummers for the Vegas Golden Knights — known as "drumbots," naturally — perform before Game 4 of the Western Conference Finals, which the Golden Knights won against the Winnipeg Jets earlier this month. All right, one more shot of the show Monday night: Zack Frongillo, in the red cape, stands in for the Capitals as he makes a hapless attempt to defeat the Golden Knight, played by Lee Orchard. Spoiler alert: The knight wins. Let's dispense with the obvious first: This is not your typical ice hockey pregame show. Watch virtually any team but the Vegas Golden Knights, and you'll find the performance before the game pretty straightforward. There's the highlight reel on the Jumbotron above center ice, the overloud pump-up song, the dimmed lights — yada yada yada — then bam, the home team takes the ice as the fans above the rink erupt in ear-splitting cheers. Simple, right? What happens in Vegas is not simple. Take a gander at the video above, if you happened to miss Game 1 of the team's Stanley Cup Final against the Washington Capitals. 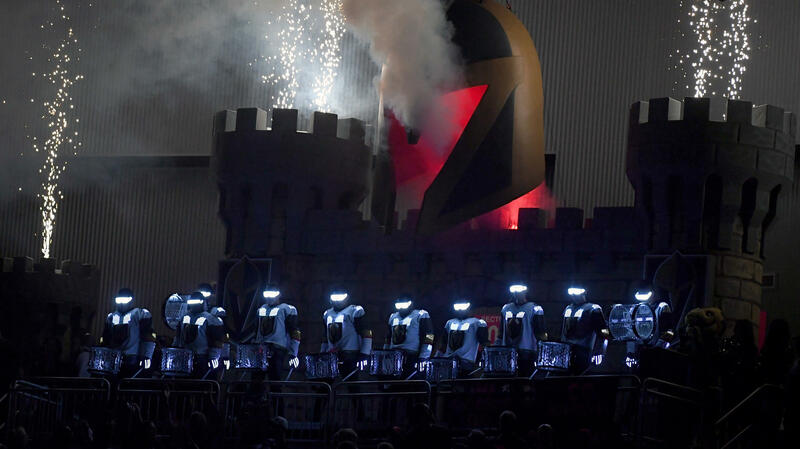 There was a live-action medieval sword fight, there was a drum corps sporting neon visors straight out of Star Trek, and of course — for reasons somehow both baffling and perfectly apt — there was a giant, firework-spitting helmet. There was even an introduction from "Let's get rrrrready to rumble!" himself, legendary boxing emcee Michael Buffer. "The No. 1 thing that we're doing is creating home ice advantage," Jonny Greco, Vegas' vice president of entertainment production, tells NPR's Mary Louise Kelly. He and his colleagues are the ones tasked with finding the right way to represent the Vegas Golden Knights, a brand-new team that, as an expansion franchise, had never even played an NHL game before this season. They've been designing pregame shows all season. Now the team has managed the miraculous and made it to the Stanley Cup Final against the Washington Capitals — and Greco says the tall task remains the same. "We want to create an atmosphere that give our boys on the ice a little extra oomph, a little extra volume, a little extra cheering from the fans." And because they're in Vegas, naturally they decided to do it with, well, a little extra. "We threw everything on the wall," says Greco, who previously had some experience with just that as a live events director for professional wrestling. "Do we want to go traditional — which is great and is no-frills — or do we want to go Vegas? Because we also talked about going uber-Vegas." Even with the slightly understated version they settled on — and admittedly we're kind of stretching the definition of "understated" here — ice hockey fans elsewhere have reacted with their fair share of ambivalence. As it turns out, fans of a sport famed for its stoic players have occasionally had unkind things to say about the blowout display. But Greco says he is satisfied his intended audience gets it. "That's the beauty of art, right? If everyone did the same show, it would just get kind of numb. It's important to change. And it's good to not like things — that's OK," he says. "But we had to honor the city." Not long ago, nearly everyone dismissed the Golden Knights as little more than a bunch of supporting cast members, little-known extras deemed expendable by their previous teams. Now, they're introduced with rousing statements over the loudspeakers about how nobody believed in them. 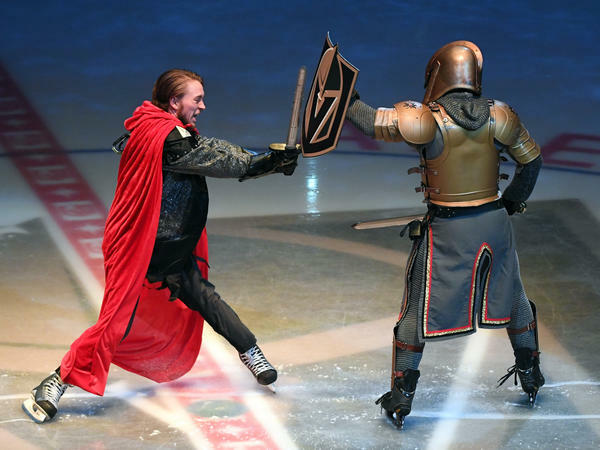 It seems suitable that when they take the ice for Game 2 on Wednesday, the Golden Knights will be the main event of a spectacle fit for Vegas. "You don't see that anywhere else, right? It's unique and special. I think it works. I think it's good entertainment," the team's starting goalie, Marc-Andre Fleury, said Monday. "Once we step on the ice and people in the crowd are excited and into it already — I think it's awesome." Tonight in Las Vegas, Game 2 of the Stanley Cup Final is the main event barely. The elaborate pregame show for the Vegas Golden Knights is a close second billing. Now, most NHL teams keep their pregame shows pretty straightforward. The arena goes quiet. Maybe the lights turn off. The Jumbotron shows a highlight video. The players skate out onto the ice, and the game begins. But this is Las Vegas, and straightforward just doesn't cut it. UNIDENTIFIED PERSON: The West belongs to Vegas. KELLY: There are flames shooting up out of a castle, neon robots, a sword fight on the ice, all culminating in the actual Golden Knights themselves skating out of a giant knight's helmet which of course is billowing with red smoke. And all of this is set to the "Ride Of The Valkyries." KELLY: The guy responsible for all this is Jonny Greco. He is vice president of entertainment production for the Golden Knights. Before that, he was a live events director for pro wrestling. Well, I caught up with him today as he was prepping for the show at T-Mobile Arena. And I asked him, given this is the Golden Knights' first-ever season - they were starting from scratch - what kind of debate was there about just how Vegas to take this thing? GRECO: ...On skates? Like, and we kind of found a happy medium. You know, you got the slot machines and the dice roll that says make some noise. And, you know, we tried to balance all of that there, but we definitely talked about going - running the whole gauntlet of traditional to, like I said, Elvis as a PA announcer or host. KELLY: So you landed on Vegas - whole lot of Vegas but not quite full uber-Vegas. KELLY: ...Played the Winnipeg Jets. KELLY: ...Y'all were playing the San Jose Sharks. KELLY: What's been your personal favorite? GRECO: You know, I'm a little partial to cutting an airplane in half because the juxtaposition of a medieval knight - a warrior with a sword skating on ice in Las Vegas, slicing a F-18 in half just kind of sounds so crazy. You're like, that's not going to work. And it did (laughter). KELLY: I should just mention you didn't actually bring a jet onto the ice. This was a projection, right? GRECO: Very good point. Yeah, a lot of our elements - because you don't know who you're going to play. You know, sometimes you have a couple of days to prepare for this elaborate, you know, event. So we were either going to play the National Predators, which is a saber-toothed tiger, or you were going to play the Winnipeg Jets. So those opens couldn't have been any different as far as an experience goes. GRECO: So we were either talking about a live tiger on the ice or, you know, potentially slicing a jet in half. And ice projection allows you to suspend disbelief a little bit more versus practical elements. KELLY: Before I move on from the tiger, did you ever at any point actually contemplate the live tiger? GRECO: ...So nothing happens on the ice? We threw everything out on the wall. And usually we go real big. KELLY: Thank God you played the Jets (laughter). GRECO: Yeah, yeah. Probably the whole world was happy that Winnipeg won in that case, I guess. The number one thing that we're doing is creating home-ice advantage. We want to create an atmosphere that gives our boys on the ice a little extra oomph, a little extra volume, a little extra cheering from the fans. They can pick up on that energy, and it helps them just go a little harder. Like, that's kind of incredible. KELLY: Well, Jonny Greco, thank you so much. GRECO: It is my pleasure. It is my honor, and I'm super excited about what's going to happen tonight. And I was super excited to talk to you, Mary Louise. Thank you. KELLY: It has been our pleasure. That's Jonny Greco, vice president of entertainment production for the Vegas Golden Knights, talking to us from the arena where they will be facing off against the Washington Capitals - Game 2 tonight. (SOUNDBITE OF RICHARD WAGNER'S "RIDE OF THE VALKYRIES") Transcript provided by NPR, Copyright NPR.